‘ĀINA In Schools is a farm to school initiative that connects children to their local land, waters, and food to grow a healthier Hawai‘i. Kōkua Hawaiʻi Foundation works directly with 19 Oʻahu elementary schools that have implemented the ʻĀINA In Schools program. Three new ʻĀINA Schools were added this fall. One hundred and eight Nutrition Docents led 356 nutrition lessons, reaching 1,864 students, while 250 garden and compost docents delivered 808 garden and compost lessons to 4,257 students. These docents also shared their time attending docent trainings and caring for the school gardens. One hundred eighty students participated in weekly garden clubs. Six partner chefs provided 7 ʻĀINA Chef Visits to schools this semester with 394 students making healthy, kid-friendly recipes with local and school garden-sourced ingredients. Kuʻi ʻAi Demonstrations were delivered to 84 students who helped to pound ʻulu into ʻulu poi. ‘ĀINA Schools provided 36 ‘ĀINA-themed educational outreach events including film screenings, cooking workshops, wellness nights, farmers’ markets, CSAs, and other ʻĀINA-themed fundraising. Over 500 family, school staff, and community members volunteered at 15 Garden Parties. 53 educators from 31 schools and educational organizations across Oʻahu were trained this semester to implement the ʻĀINA garden, composting, and nutrition curricula with hundreds more students across the state. Sixty seven teachers, ʻĀINA docents, and parents attended our Farm to School Field Trips for Educators, visiting ʻĀINA schools, farms, and restaurants. ʻĀINA In Schools also provided an ʻĀINA Curriculum and hands-on Bokashi Training to 16 California-based garden educators to utilize in Santa Barbara County Schools. Kōkua Hawai‘i Foundation Field Trip Grants give schools the financial assistance needed to bring students to outdoor sites where they can experience hands-on learning about Hawaiʻi’s environment. This semester Kōkua Hawaiʻi Foundation granted field trip support to 5,509 students from 62 schools. Field trip destinations include: Bishop Museum, Hawaiʻi Nature Center, Holoholo Farm, Kaʻala Farms, Kahuku Farms, Kuʻu Home Kulāiwi, Lyon Arboretum, MAʻO Organic Farms, Mari’s Gardens, Nā Mea Kūpono, Paepae o Heʻeia, Papahana Kuaola, Waimea Valley, and many others. 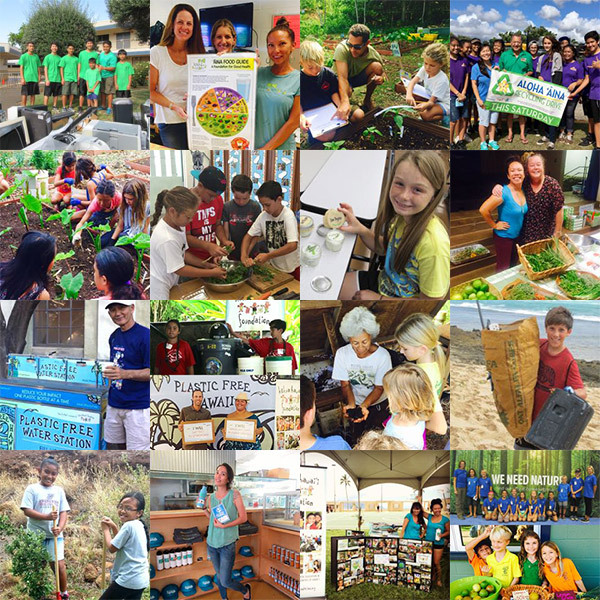 Kōkua Hawai‘i Foundation Mini-Grants support teachers and students from Hawai‘i schools in advancing their environmental education goals and pursuing innovative stewardship projects in and out of the classroom. 3,490 students from 22 schools are participating in environmental projects supported by KHF Mini-Grants this semester. Projects focused on school gardens, farming for local families, plastic-free campuses, vermicomposting, nutrition lessons, and waste reduction. 3R’s School Recycling Program empowers students to engage and educate their school community about the 3R’s—reduce, reuse, recycle. KHF currently supports 62 schools with their on-campus recycling and composting solutions and is ramping up the 3R’s School Recycling Program island-wide with more recycling supplies and educational resources for schools. KHF continues to work closely with the Hawaiʻi Department of Education, which now provides campus-wide recycling pickup for 176 Oʻahu schools. Additionally, KHF hosted 9 Aloha ʻĀina Recycling Drives this semester where over 55,000 pounds of metals, electronics, beverage containers, cardboard, paper, batteries, and oil were collected and diverted from the waste stream. More than 100 student volunteers supported the drives, with proceeds from the sale of select recycled materials going directly to the host schools. Plastic Free Hawai‘i provides resources, tools, and trainings to educate schools, business partners, and community members on the environmental and health benefits of going plastic free to minimize the consumption of single-use plastics in our islands. 749 volunteers participated in Oʻahu beach cleanups, giving more than 1,872 hours to remove over 14,700 pounds of trash and marine debris from our beaches. Much of this debris was recycled with the Parley for the Oceans project to be recycled into Adidas store interior materials. PFH educational presentations were made to 275 students on Oʻahu. KHF also coordinated visits by 5 Gyres co-founders Marcus Eriksson and Anna Cummins to an additional 11 schools reaching 975 K-12 students. PFH outreach booths at 9 community events reached 4,515 people, and PFH also hosted 3 film screenings on plastic pollution, including the world premiere of “The Smog of the Sea” by Ian Cheney reaching over 300 people. Our PFH water refill stations eliminated the need for single-use plastic water bottles at 3 large community events, reaching 2,950 people with clean, filtered water. 7,338 Plastic Free Hawaiʻi reusable bottles, sporks, tote bags, utensil sets, and stainless steel cups have been distributed at school and community events to empower people with tools to live plastic free! We currently work with 13 local businesses who retail our Plastic Free Hawaiʻi merchandise. Additionally, we are key partners on the Ocean Friendly Restaurants Hawaiʻi program, which now has nearly 100 restaurants certified for taking measures to reduce waste and the use of single-use plastics. Educational Events allow us to share a variety of environmental education initiatives with a broader community audience including parents, educators, and school administrators. This semester thousands attended KHF-supported presentations, trainings, workshops, conferences, and discussions. KHF was instrumental in greening the IUCN World Conservation Congress, which was attended by over 10,000 international and local leaders in conservation. KHF also partnered with organizers in engaging over 1,000 students at two WCC youth events. At the North Shore Food Summit, 130 students from 5 schools toured local farms and shared their plans for reducing and diverting food waste at school. In a series of Simplify the Holidays Workshops with partners MAʻO Organic Farms and the Art Explorium, over 200 participants were empowered to create gifts with reused and locally sourced ingredients.